CONCORD – Learn about dog sledding, blacksmithing, contra dancing and more next week, when a traveling exhibit that celebrates some of the music and craft traditions of New Hampshire is on display at the Legislative Office Building. 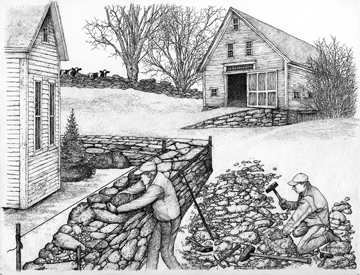 “Discovering Heritage Arts in New Hampshire” will be up in the garage lobby of the Legislative Office Building, located at 33 North State St., across from the State House, April 6 through 10. Open Monday through Friday from 9 a.m. to 4 p.m., the exhibit is drawn from educational activities on the New Hampshire Folklife Web site (www.nh.gov/folklife). The Web site is an educational resource developed by the New Hampshire State Council on the Arts’ Traditional Arts Program. The related activities on the New Hampshire Folklife Web site are called Heritage Arts Build-A-Pictures Activities. They are designed for young people third grade and up and, can be especially helpful to teachers of all grade levels who are covering units on New Hampshire history. “Learning the language of traditions expands our literacy and helps us value those who preserve our traditions,” says Lynn Martin Graton, the traditional arts coordinator for the New Hampshire State Council on the Arts who coordinated the Web site activities and the traveling exhibit. The Heritage Arts Build-A-Pictures Activities were developed by the Traditional Arts Program and the unique interactive functionality of the pages was developed by the Department of Information Technology's Web Support Division. For more information on the exhibit or the folklife Web site, contact Graton at lynn.j.graton@dcr.nh.gov or 603-271-8418. The exhibit and folklife Web site are projects of the New Hampshire State Council on the Arts with funding from the National Endowment for the Arts.